Moderate an in-class discussion based on the video, focused on the question: does injustice pay? Is it better to be immoral than moral if one could get away with one's immoral behavior? 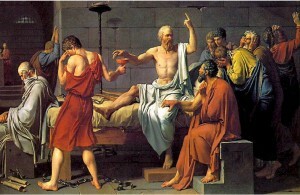 After reading ‘Socrates on Happiness’ and Book One of Plato’s Republic, what features of Socratic happiness do you find most appealing? How would you define happiness? After reading ‘Socrates on Happiness’ and Book One of Plato’s Republic, think about the relations between morality and happiness. Do you agree with Plato that the most moral people tend to be the happiest? Begin class asking some students to read from their answers. Engage students in a debate about happiness and whether or not it is more associated with pleasure or with morality. Connect discussion to Positive Psychology and similar debate between happiness as SWB (Subjective well-being) and PWB (Psychological well-being). Discuss Robert Nozick's thought-experiment, the experience machine (use in class handout here). Nozick asks us to imagine an experience machine that could give us whatever desirable or pleasurable experiences that we could possibly want. Scientists have figured out a way to stimulate a person's brain to induce pleasurable experiences (think of some Matrix-like machine that can produce any virtual reality). The experiences inside of the machine would be just as real as our experiences in the real world. He asks us, if we were given the choice, would we choose the machine over real life? Would we choose to program a life for ourselves that is based solely on achieving pleasurable experiences? And if not, why not? Connect this question to the main theses of psychological hedonism, ethical hedonism, and utilitarianism. Then connect back to the readings on Socrates: what would Socrates say about the experience machine? Note to the students that his full response will not come until Book Nine of the Republic. Q: If you had a ring of invisibility like the one described in Book Two of the Republic, would you use the ring, even at the expense of law and morality? If not, why not? And would this be a good enough reason? One Response to "Socrates on Happiness"
In order to illustrate this problem Nozick imagines a science-fiction type story in which it is possible to plug our brains into machines which would provide us with any kind of experiences we could possibly desire. Therefore says Nozick there is no reason why we would not plug in to an experience machine. ..Well Nozick claimed that people would not want to be hooked up to this machine.